It's probably for COD: Infinite Warfare. Man, this YouTuber Activision has hired to promote its newest Call of Duty has kind of gone off the rails, hasn't he? I don't want to tell him how to do his job, but promising to “rip us from the history books”, “blot out our skies”, and “bury us in darkness” seems like a risky tactic. He doesn't even end the video with the traditional “please like and subscribe”. What's that you say? Oh, he's the villain in the next Call of Duty? That explains his villainy appearance and his incredibly boring speech, then. 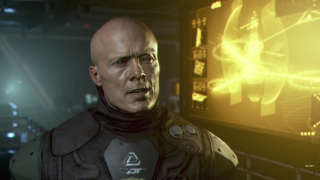 While this first teaser for the next COD – almost certainly titled COD: Infinite Warfare – stops short of screaming “hey, this what the next Call of Duty is all about”, we can glean one salient bit of information: Mr. Villain up there is the leader of something called the Settlement Defense Front. Which settlement are they defending, and why are they so upfront about it? I cannot say. But I do know that Infinite Warfare/the next COD is also being teased in Black Ops 3's Nuketown map, via the surprise appearance, among other things, of a futuristic airship. Reports from March have it that Infinite Warfare takes place in the far-future, in a “full on sci-fi” setting.